Private equity firm Aliter Capital LLP has brought together Glasgow-based IT firm Boston Networks and North Wale-based Pinacl to create a UK-wide network infrastructure and integrated technologies business. “The combination of Boston Networks, Pinacl Solutions and Pinacl GDA will create a UK-wide organisation with a staff of over 300 and a turnover approaching £50 million,” said Pinacl. Pinacl specialises in the design and management of ICT infrastructures encompassing the IoT, Smart Buildings and Cities, and major fibre optic network infrastructures. Boston Networks recently launched the pioneering £6 million IoT Scotland, the UK’s most-advanced IoT network after being chosen to lead the commercialisation of IoT across Scotland. Pinacl was recently awarded a contract to deliver an IoT driven intelligent street lighting for Aberdeen City Council. Boston Networks CEO Scott McEwan said: “Pinacl is a business we have admired for many years. “It is a sophisticated business and offers complementary technologies, customers and geographical coverage. “It will be business as usual for the two companies and I’m looking forward to working with their senior team. 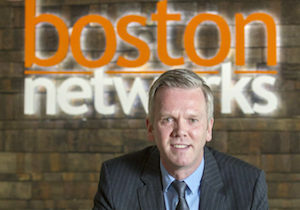 Greig Brown, partner of Aliter and chairman of Boston Networks said: “Since our investment into Boston Networks, we have been extremely focused on creating a national provider that has major credibility across the networking and systems integration market. Rob Bardwell, Pinacl CEO, said: “Pinacl has had impressive growth over the last 4 years and has an appetite to accelerate its growth further. “We have been impressed with the Aliter approach and we know the Boston Networks business very well.